Home Info FAQ Uses Reviews View Unit Coolers Shipping Contact BUY NOW! 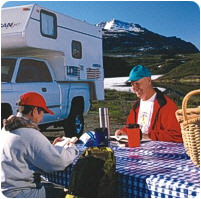 Pop ups and campers are a fantastic way to get out and enjoy the great outdoors but roughing it while in your camper only goes so far with some. Feeling comfortable is the purpose of the camper after all, don't fall short by not being cool while enjoying every moment day or night. Its a jungle out there not in here! 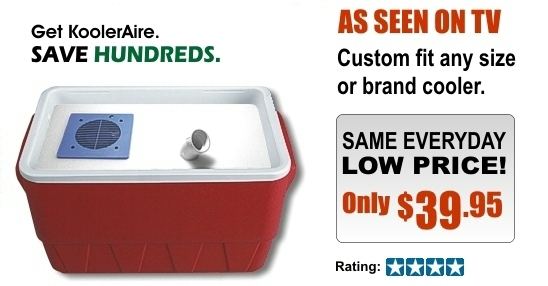 This affordable adapter will covert your existing cooler into an portable camper air conditioner for use anywhere! Its the must have solution to all your camper air conditioning needs that's portable and efficient! KoolerAire's space saving 12v ice chest cooler continues to be the most popular, portable, reliable 12 volt camper conditioners ever! Our success is simple; Reliable, cost effectiveness, quality, and performance backed by years of customer satisfaction! With KoolerAire's exclusive patented design air conditioning has become more portable than ever before! Unlike others styles its not restricted by messy hoses, pads, pumps, or even a water supply! And, to top it off, our wide range of power options means you can take it anywhere! Our attractive, compact profile, whisper quiet fan, and low power consumption makes KoolerAire the economical alternative to twelve volt, portable camper conditioners costing hundreds of dollars! In addition, KoolerAire's low amp draw translates to much longer run times compared to all other brands! Order yours today and see what thousands of satisfied customers already know...KoolerAire works for hundreds less! Why settle for just an ice chest when you can have both a cooler and camper air conditioning in one? Several key features have contributed to KoolerAire's success the first being price; KoolerAire is affordable no doubt, it will also cool just as well and longer than any expensive brand. Second, you already own a cooler why buy another one? KoolerAire will fit right inside your existing ice chest and won't take up valuable space inside or out. And last but certainly not least...IT WORKS! KoolerAire will help you beat the heat for hundreds less, no fuss, just add ice for a cold refreshing breeze that didn't cost an arm and a leg! From the Coleman 28 quart to the gigantic Igloo 72 quart and everything in between KoolerAire's got you covered! Our 12 volt air conditioning design ensures a nice snug fit around the top portion of virtually any cooler on the market, it is this fit that enables it to work so effectively! From the moment the unit is turned on air is forced downward into the sealed, ice filled cooler. This airflow moves across the ice and is chilled to approximately 50 degrees before exiting! Living in Central Florida and having just experienced two hurricanes in three week's time (we're still not sure what Ivan is going to do), I had to write. After Charley but before Frances, I ordered the unit and it arrived quickly with time to spare between the two storms. We lost power for 4 days during Frances and boy was I happy to have the KoolerAire, which we used with a portable 12 volt power source. Once power was restored, our air conditioner quit so the KoolerAire was once again called to duty. Your conditioning product helped us 'keep our cool' in a trying situation and I thank you for offering such an innovative product. B. Rosko Mt. Dora FL. My 12-volt favorite is a camper air conditioner from New York Based KoolerAire. I've used it to cool a boat cabin, an RV and my bedroom at home during a power outage. The device was developed by a New Jersey boater who realized that he could cool his cuddy cabin using an ice filled chest with the lid open. I found the unit works best when you fill & freeze the entire ice chest for prolonged operation. However, Blue Ice or frozen water bottles are also good - they're also more portable, don't make the air damp, inexpensive, and spares can be kept frozen for use at another time. Don't forget you may continue to keep your food and beverages in the cooler while it also cools you! Dan Armitage is an outdoor writer based in Columbus. He covers for Outdoor Life, and also contributes regularly for Oh. Game and Fish, Oh. Outdoor Times, Oh. Country Journal, Bass and Walleye Boats, Trailer Boats and other publications.